The new Hum Kleaner is designed to eliminate Hum at the source while also amplifying the purified signal so that it may be pushed over long wire runs. In addition to eliminating common hum issues, it is equally important that your amplifier receives the required signal voltage to maximize available performance. If your powered equipment is not receiving the required signal voltage then it is impossible to perform at the level that the manufacturer intended. That is why the engineers at Earthquake Sound decided to integrate a pre-amplifier into the Hum Kleaner’s noise-suppression- circuitry. This device is not just a line converter, on-board is an amplifier capable of boosting a signal to 9V (RCA) or 18V (TRS/XLR). The Hum Kleaner provides two channels of unbalanced-to-balanced level conversion and two channels of balanced-to-unbalanced conversions in a resilient, compact, and portable unit. 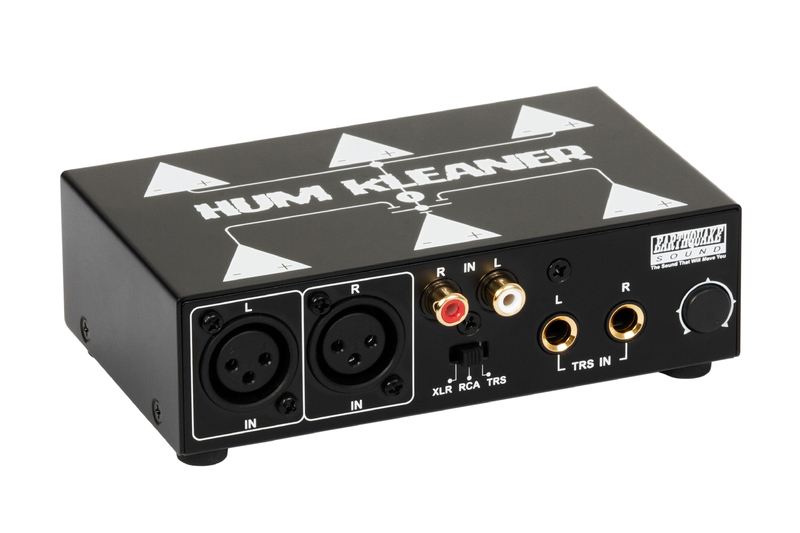 The Hum Kleaner can be a valuable tool in application areas such as home, professional recording studios, live sound, PA, DJ, AV or anywhere else where signals need to be pushed long distances while retaining clarity. It also works with mixers, audio, processors, laptop computers, CD/DVD players, gaming consoles, powered monitors, and digital workstations. The Hum Kleaner is a pre-amp unit that takes the input from an RCA (non balance), TRS (balance or unbalance), and XLR (balance or unbalance); then the switch will allow any of these input to activate the unit. Thereafter, there is a gain knob that allows the user to increase the gain level. Thereafter, the Hum Kleaner isolates the ground, and the positive of the input and the output from any type of connection. Therefore it kills any change of a ground loop while it amplifies the signal. Vinyl disk player: Vinyl disk player’s product has a weak signal under 50 mv. The Hum Kleaner will act as a pre-amp for this signal. The THD+NOISE= 0.0003 at 1000 HZ. The gain at max will allow 18dB gain (three times the input level) on RCA. The max gain on XLR allows for 24 dB (four times the input). Example: The vinyl disk player will have about 50 mv input into the Hum Kleaner will have a 0.6 VAC out on the RCA and a whopping 1.8 volts AC signal on the XLR. Recording studio headphone type. This offers a massive control for headphone as it increases the signal to noise and signal level. DJ, live concert, live band it will isolate the input signal from causing any problems. This offers an instrument’s isolation for guitar players, singer, or any other input instrument from causing hum problems into the mixer. Furthermore the Hum Kleaner amplifying function will be used as a level control that will match the sources. SIGNAL DRIVER: The Hum Kleaner signal driver function is used when the installer has a music source, DJ, control room in a school gym, or any application where the install has 100ft. and up to 400ft. of CAT5 or 6 as well as RCA or XLR (most recommended). These distances are between a source to the powered speakers such as DJ 2.1, DJ10, and DJ8 The Hum Kleaner would amplifier the signal up to 16 VAC while it is transported around power lines that generate magnetic flux line which inductively generate hum into any wire. So the Hum Kleaner drives up the signal and then it allows a clean transportation. This type of install is suited for the pair of Hum Kleaner to drive up the signal and then 400 feet later, use HLLC200 to reduce the signal into 1-3 Volts AC to drive any products without any hum. These are some of the uses of this unit. IT WILL BE AN EXCELLENT ITEM IN ANY INSTALL.